Your account includes three Shelves that you can use: Completed, In Progress, and For Later. Items that you rate, tag, or add comments to are automatically added to your Completed shelf. You can also add titles to your Completed shelf from your Checked Out or On Hold lists, search results, title screens, or your other Shelves. You can use the For Later shelf to keep track of items you might want to check out from the library some day, but do not want to place a hold request for just yet. The In Progress shelf can be used to keep track of what you are currently reading, watching, or listening to. When searching the catalog or browsing a list of items, you will see options to add things to your Shelves. The default setting is to add items to the For Later shelf, but you can select one of the other options. Click to add items to your For Later, In Progress, or Completed Shelves. When browsing a list, click the Books icon to add items to your Shelves. Shelves can be sorted by date added, title, author, or rating. Shelves can also be filtered by format, audience, or other criteria. 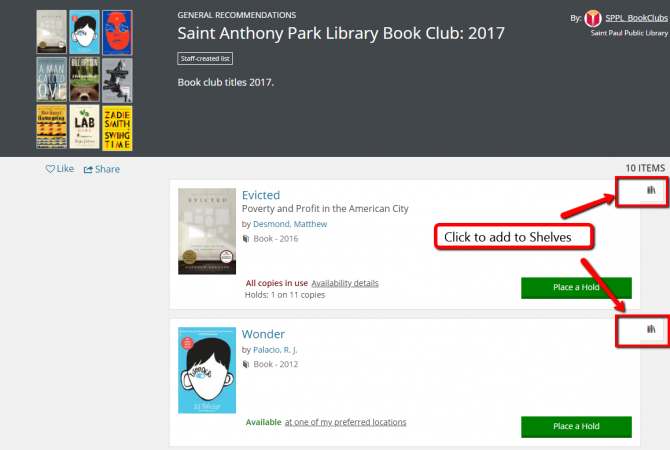 You can get to your Shelves by following the links under the account menu in the top right corner of each page of the library's website. Your Shelves and Lists are found under "My Collections". You can also find your Shelves listed under "My Collections" on your Library Dashboardopens a new window. 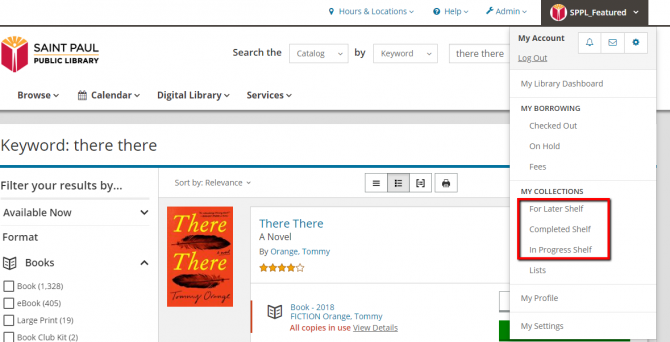 On your Library Dashboardopens a new window page, items from your For Later shelf that are available will show in the Available Now box at the top of the page. These items will include links to place holds on the items directly from that box. The Available Now box features links to place holds on items on your For Later shelf that are available to request. Items that are already on your Shelves will be indicated as such in the catalog when you are logged in. If you are searching for a certain author of researching a topic, you can see the items you have already marked as Completed or place them on your For Later shelf to come back to in the future. if you have reached your hold limit, you can place things on the For Later shelf so you can place hold requests on them when space opens up on your Holds list. Your Shelves can be shared or they can be made private. Regardless of the settings you choose as the default for your Shelves, you can choose to share or keep private individual items on your Shelves. See more information about Sharing Your Shelves (and Keeping Them Private). More information about using Shelves.